The Linares Palace is situated on one corner of the Plaza de Cibeles Square, dates from the 19th Century and is well-known for its beautiful architecture and exquisite interior. It's one of Madrid's most emblematic palaces. 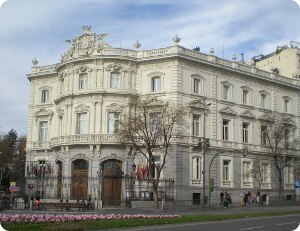 Built in 1873, the Linares Palace is a worthy member of the line-up of grand façades on the square. It's one of the finest examples of neo-baroque design in Spain, in style and French in inspiration. Its main façade is outstanding, spectacular, with three entrance doors crowned by balconies. The interior features a wealth of decoration by such prestigious artists as Jerónimo Suñol, creator of the stunning marble banister on the staircase in the hall. Other important areas of the building include the ballrooms, the Hall of Mirrors, the chapel, Dolls' House and the garden. In the palace's grounds is the Casa de América (America House), a modern exhibition centre which, also hosts all sorts of cultural events throughout the year. Headquarters to an organization responsible for improving relations between Spain and South America. It contains a newspaper and magazine library, a video library, several exhibition rooms, and an auditorium, as well as a restaurant, shop, museum, and bookshop. It also has an interesting history and is said to even have its own ghosts. The story of the palace and its owners is actually very sad. The palace was built by José de Murga, the Marquis of Linares, for both himself and his wife. His father had educated him to choose a wife without consideration of her financial or social class. This he did and he married the tobacconist's daughter. What he didn't know was that his father had had a relationship with the mother and his wife was the result. He only found out when his dying father, sent him a letter to inform him of the situation. The Pope at the time, Leo XIII, had to issue a papal bull which allowed them to live together but in chastity. In order to forget the shame the Marquis threw all his energy into the building of his palace, where budgets and time had no constraints. The Marquis and his wife told the architect that they would like the Palace to be split in two, with him taking the ground floor and the wife the upper floor. What is interesting is that they didn't have a kitchen, but instead relied on food being delivered from a restaurant. Before knowing they were brothers, conceived a girl, which the illustrious family decided to remove from your environment to safeguard the good name of the house. Then the girl's mother, embittered, accepted that her daughter was taken to a orphanage. In the will José de Murga and his wife, pleaded not having childrens. This daughter is the ghost that haunts the palace from time to time, crying because she has no "mummy". Monday to Friday: 11:00 to 20:00. Saturdays and Sundays, guided tours at 11:00, midday and 14:00. Closed: 1 to 31 August, and 9, 10 October.